Jerry can't wait to explore the dark, spooky old cave he found down by the beach. Then the other kids tell him a story. A story about a ghost who is three hundred years old. A ghost who comes out when the moon is full. A ghost . . . who lives deep inside the cave Jerry knows it's just another silly made-up ghost story . . . isn't it? FINALLY finished this one I started with my son. 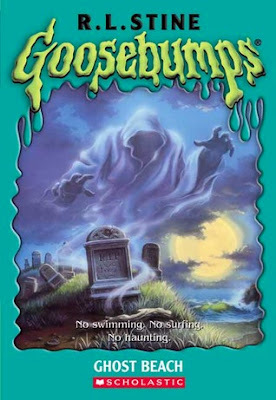 We went through a phase of watching the show Goosebumps together on TV, and after we watched this episode, he turned to me and made my reader's heart proud by saying, "The ending of the book was better!" The story is basic and simple - the two kids, brothers and sisters, are visiting their aunt and uncle on vacation. They run into three kids who keep warning them away from the cave at the beach. They claim their is a ghost in the caves that's trying to draw them in. It's true that there is someone in the cave trying to draw them in, but it won't be for the reason you're reading about. The cliffhangers at each chapter got a bit annoying but I suppose for the age group it makes sense. It's a technique Stine uses for these young adult books. At an adult age level it can grow tiresome but I see how it can be fun for children, spurring them on to continue turning the pages. The false scares and thrills also grow irritating to me but can be exciting for children; if so, they were for my son. Parents: There's little gore and no real violence other than implied. The ending did have me chuckle - I admit through reading it I was expecting more of a scooby doo type ending (it wasn't.) Good clean type for young adult thriller genre.